Gorgeous flowing gardens, ancient gothic architecture, bubbling champagne, stunning crystal, and sumptuous fabrics; these are the things that come to mind when thinking of a city that’s name is synonymous with romance. Of course, these are only the physical manifestations of amore that beckon to lovers young and old, for anyone who has ever visited the city knows that passion is carried through in everything Parisians do. Desire is ingrained within the city walls themselves and by extension, nearly anything we can think of that hails from Paris exudes the very same air of romance. It’s no wonder, then, that for Bloom Magic’s newest collection, our designers turned their eyes to Paris and instantly fell in love with luxurious hatbox blooms. Bloom Magic has always focused on quality and outstanding service. Our dedication to creating lasting memories can be seen in the freshness of the flowers we select, the artistry of each bouquet’s hand-tied presentation, and in the mindful arrangements custom crafted for each of our collections, yet we also know that even premium bouquets have trouble matching the beauty, grace, and charisma of certain people. For these very special people, and the moments that call for something truly grand, we have created our luxurious Parisian Collection. Our regal matte-black, elegant pearl white, dreamy powder blue, and soothing charcoal grey hatboxes have been carefully matched to complement each of the Parisian Collection’s offerings. Each is embossed with a Bloom Magic logo, a true mark of distinction, and is decadently layered with exquisite fresh-cut flowers, certain to take the recipient’s breath away. Just as the amorous city has many facets, from refined adoration to deep undying love and even uninhibited passion, our Parisian Hatbox Collection offers numerous bespoke arrangements, ideal to convey the depth of your emotions in a style that speaks of your unique romance. Romance Sur La Seine, our signature piece, provides a full bouquet of red roses, and speaks of devotion and sensuality. White roses, orchids, and anthuriums, come together in the almost playful Le Jardin De Monet arrangement, which is suitable to denote pure affection and offers contemporary charm. 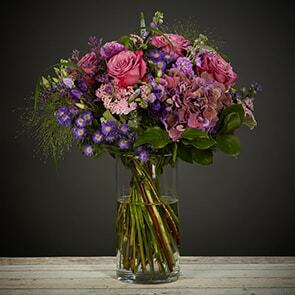 Offering another layer, the unbridled beauty of roses, gerberas, veronicas, hydrangeas, irises, limoniums, and eryngium thistles mixed in the Les Jardins Du Louvre bouquet plant the seeds of unrestrained amore. These, and many more bespoke arrangements, are now available for delivery throughout Ireland in our Parisian Collection. At Bloom Magic, we pride ourselves on providing world-class service because we know that the right bouquet can move mountains, unlock a heart, and convey what words cannot. Each of our arrangements is made from only the finest and freshest blooms, thus enabling us to guarantee a full week of freshness on each and ensuring that the lucky recipient will continue to reflect upon the thoughtful gesture for a long time to come. 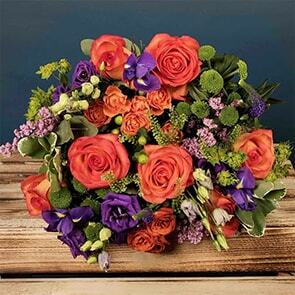 We offer same day delivery Dublin and next day delivery to all of Ireland for all our handtied bouquets. Feel free to browse our exclusive Parisian Collection and begin creating your very own Bloom Magic moment today.